With the price of gas running sky high, frugal drivers are looking for ways they can save money on fuel. 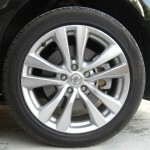 While traditional methods such as driving on the freeway as often as possible, keeping tire pressure at the correct level and carpooling can definitely help, many “green” drivers now have a new choice in addition to hybrids or electric vehicles when it comes to cutting gas consumption: eco-friendly tires. Historically, these tires were originally just an option for owners of hybrid cars. These tires may now be purchased at many different retailers, and in a variety of sizes for all vehicles. A multitude of tire manufacturers are now producing tires that help reduce a car’s carbon wheel print on the Earth. The tires typically run around the same price as traditional tires, but the way these green tires can help drivers save on fuel firmly places them in the discount tires category. Although there was originally some concern over the safety of these eco-friendly tires, and questions about whether they were truly helping the environment, an article on FoxNews.com stated that manufacturers have recently been able to produce tires that are both earth-friendly and able to meet the safety requirements consumers demand. Environmentally concerned drivers can both save money and assist Mother Nature by purchasing green tires. So how do these tires reduce the carbon footprint? Eco-friendly tires make lighter contact with roadways. Lighter contact means reduced friction and resistance which requires less gasoline to roll the car forward. These green tires are composed of non-aromatic oils in lieu of petroleum, causing them to decompose in a manner more conducive to environmental safety—and all of this is accomplished without sacrificing durability or performance. Green tires are also constructed for longevity. By rolling on longer, less energy is expended in new tire creation and less toxins are released upon the disposal of traditional tires. One interesting ingredient may be gaining traction within the tire industry: oranges. Yes, your favorite vitamin C-infused fruit is used to replace a portion of oil in one manufacturer’s tire production, according to an article on CarAndDriver.com. The orange-oil-infused tread actually improves grip as well—think about that next time when drinking your morning glass of OJ. One such fuel-efficient tire is the HydroEdge with Green X radial from Michelin tires that features Energysaver Construction technology to improve fuel efficiency and all-weather traction. The Michelin Energy Save A/S is yet another “green” tire that can help reduce fuel consumption. With its low rolling resistance, this tire is now the most fuel-efficient all-season passenger car tire, according to an article on FoxNews.com. As a bonus, it has been proven to perform well in all four seasons. No matter which eco-friendly tire drivers want to purchase, EarthGarage.com reminds us that it is always important to compare tire ratings to select the safest and most appropriate tire for a particular vehicle. Can you explain again how it would cause more road accidents?